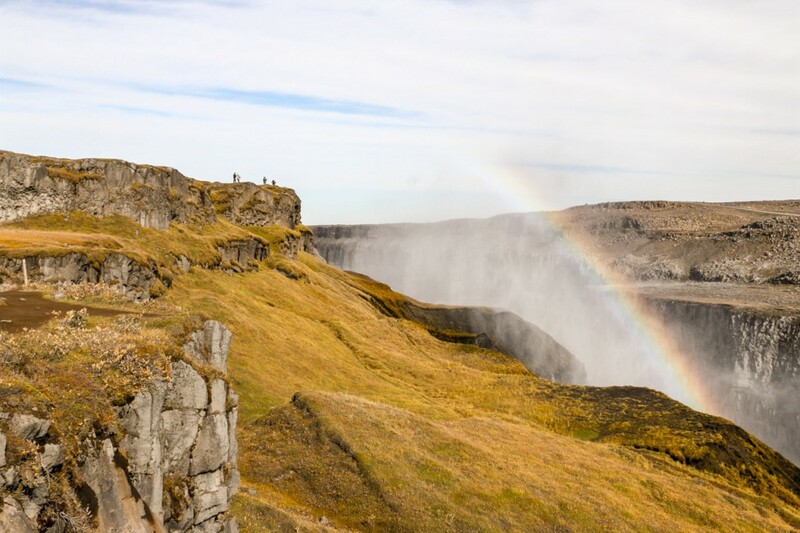 Iceland is home to a stunning collection of waterfalls, with all shapes and sizes available for the delight of nature seekers. Yay! 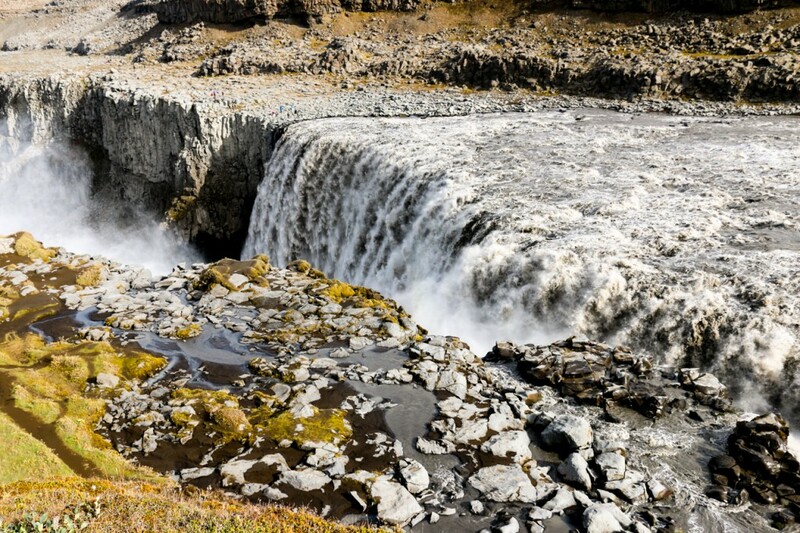 Far on the northeastern part of the island lies the mighty Dettifoss, Europe’s most powerful waterfall. How powerful? 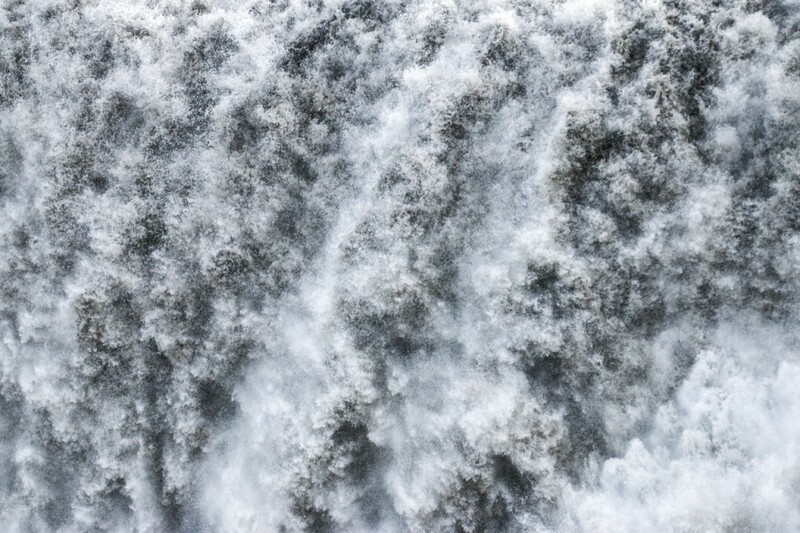 At 100 m wide and with a drop of 45 m, the average water flow is 200 m3 every second! That’s an Olympic swimming pool every 12 seconds, give or take. 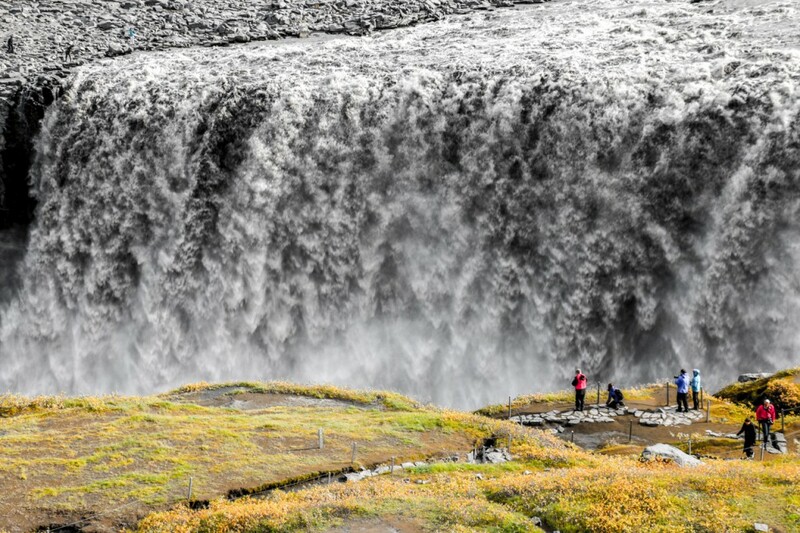 Dettifoss is on the Jökulsá á Fjöllum river, a glacial river that starts at Vatnajökull glacier and flows north for around 200 km until it reaches the Greenland sea. 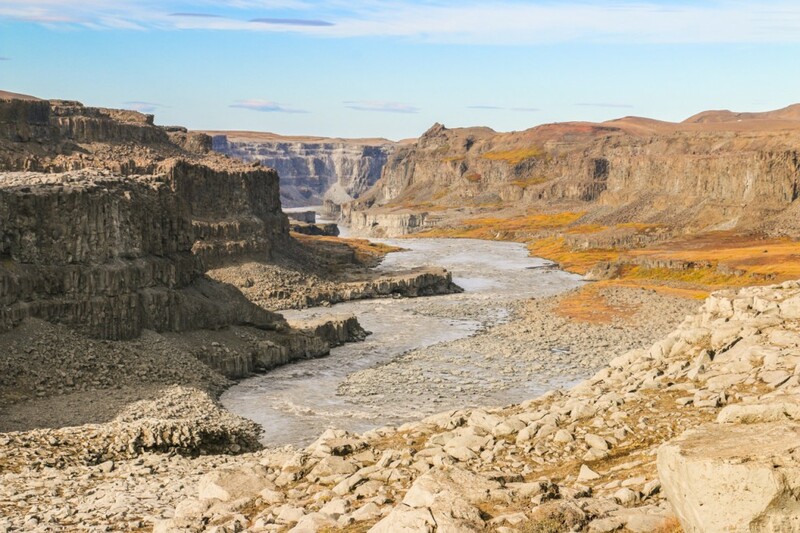 It drops into Jökulsárgljúfur canyon, which was created by massive volcanic induced glacier floods and provides stunning landscapes downstream of the waterfall. 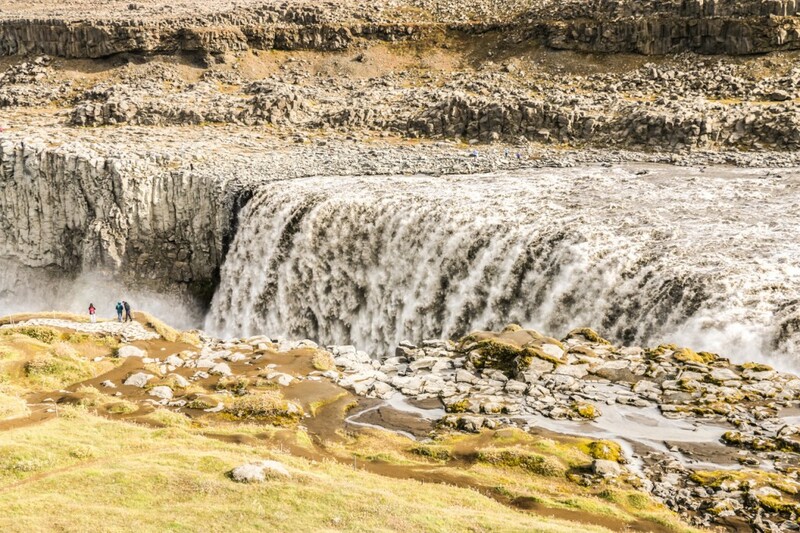 Very close, on the same stream, are also two other waterfalls, Selfoss and Hafragilsfoss. This area is part of Vatnajökull National Park. We visited Dettifoss on our way from Egilsstaðir to Húsavík, passing along the raw landscapes of the eastern part of road number 1. Far on the horizon we could see the smoke coming from the eruption at Holuhraun. A quick reminder we were on the land of ice and fire. The waterfall can be reached from the two sides of Jökulsá á Fjöllum and that’s exactly what we did, starting with the west side. Access is possible starting from roads 1 or 85, the first being the most popular option since virtually everyone is driving on the ring road, like us. We followed the well-paved road 862 towards north up until the cut-off for road 886, the one that goes to the car park. 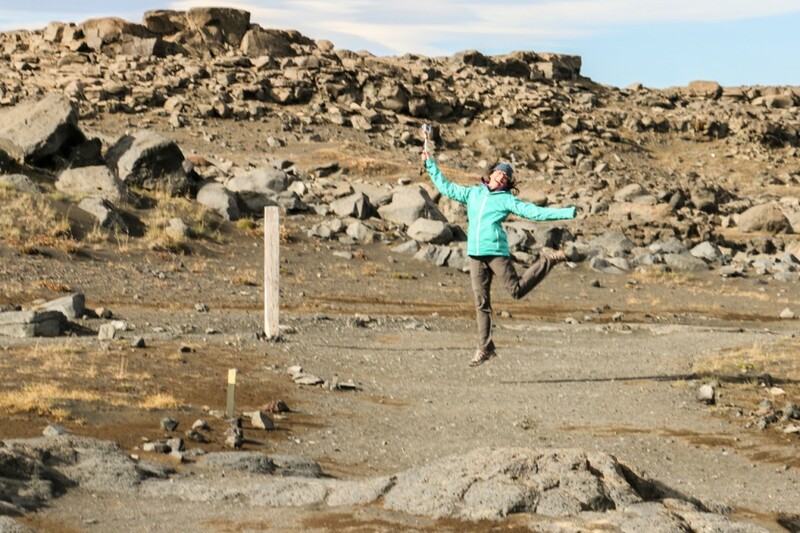 Further north, road 862 is on gravel, but the access was forbidden as a precaution due to the volcanic eruption. From the car park, it’s an easy walk of about 1 km to the waterfall. Once we started getting closer, the sound of the water plunging down was just incredible. Such power! A few more steps forward and we just stood there staring and admiring the show for a few moments. Suddenly we look left and we see a huge rainbow, as if raising from the bottom of the waterfall. 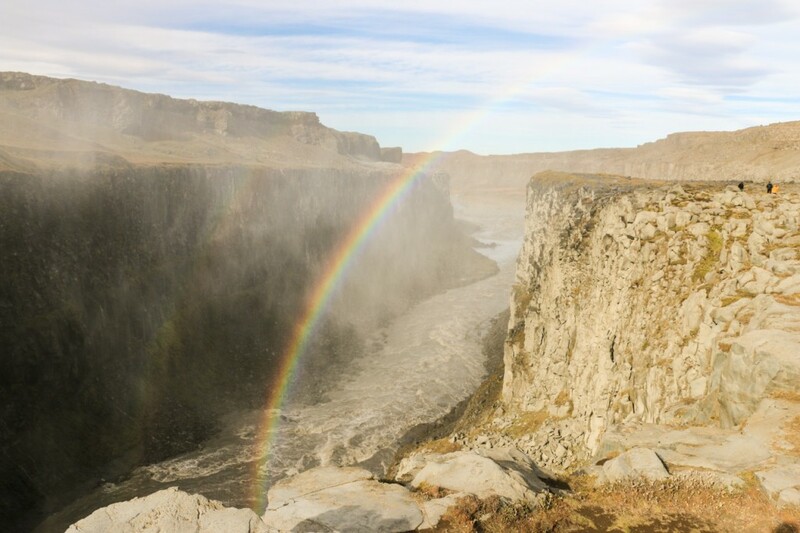 What a magnificent day to visit Dettifoss! We explored the area, walking around in order to see the waterfall from different angles. The spray wasn’t very intense, so it was perfectly fine to inch closer for a better and more detailed view. There are some marked walking paths and also safety cords. 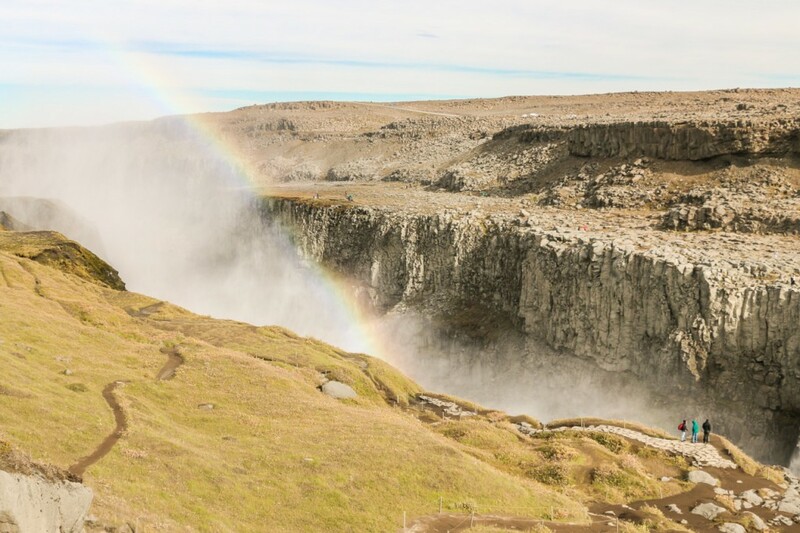 The best way to get a better perception of the actual size and power of Dettifoss is to go up the hill a little bit to a higher viewpoint and wait for some people to approach the waterfall. This should provide the necessary perspective. Also, we were pretty much by ourselves with only one group on each side which was quite nice. After over an hour or so we made our way back to the car park but not before taking another glimpse of the landscape and the huge rainbow. Someone’s happy with the waterfall! To reach the eastern side we had to backtrack all the way to road 1 and past the bridge over Jökulsá á Fjöllum. Shortly after it, the bumpy gravel road 864 goes slowly north to the car park on road 890. Only a handful of people made their way to this side of the waterfall, nowadays less popular with tourists. The car park on the east side is much closer to the waterfall. A rocky path allows to get very (very) close to it. Mind the drop. 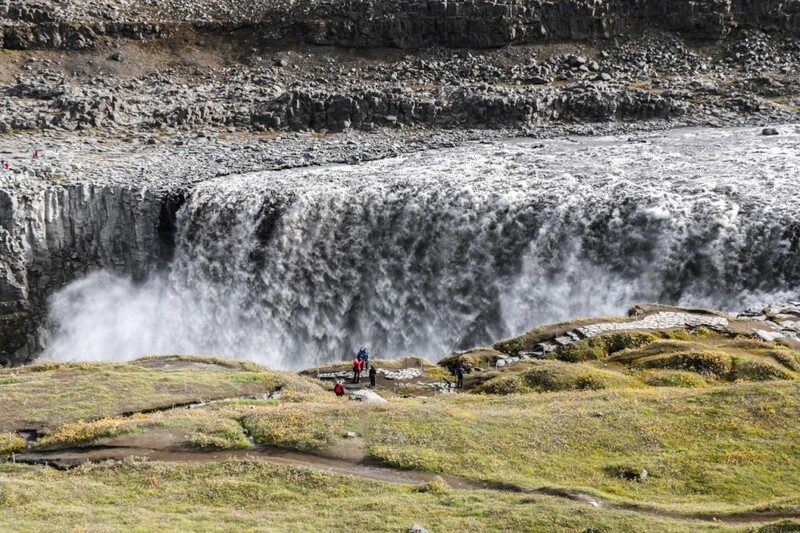 This side allows for a different view of the waterfall and a much better idea of how big the Jökulsárgljúfur canyon is. Our friendly rainbow was still present and on all of its glory. Another detail of the power! 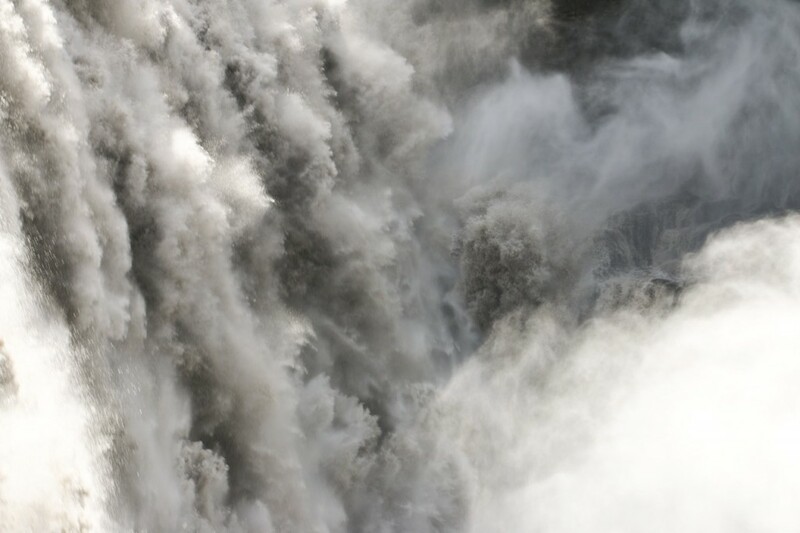 Here are two short non-edited videos of Dettifoss. 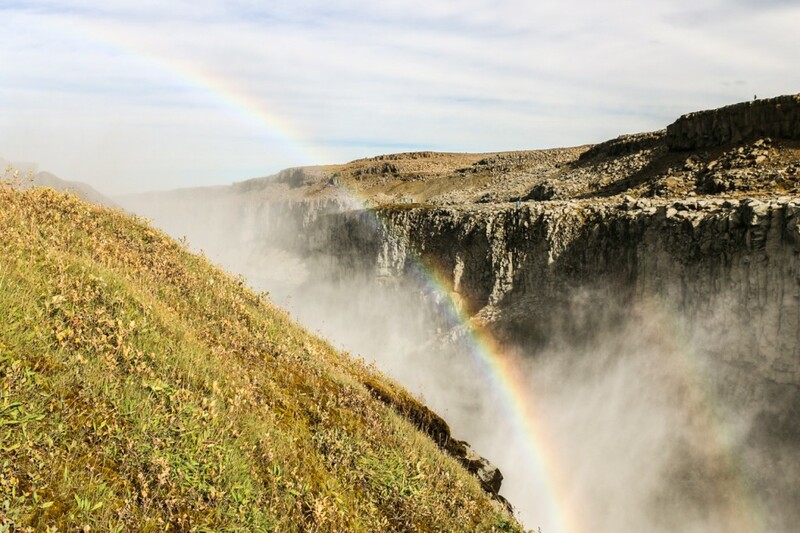 Visiting the two sides of Dettifoss allowed for a better and more complete experience and one that we thoroughly recommend. 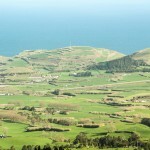 Having some freedom of time is perfect as this is a very good place for admiring nature and taking some great photos. 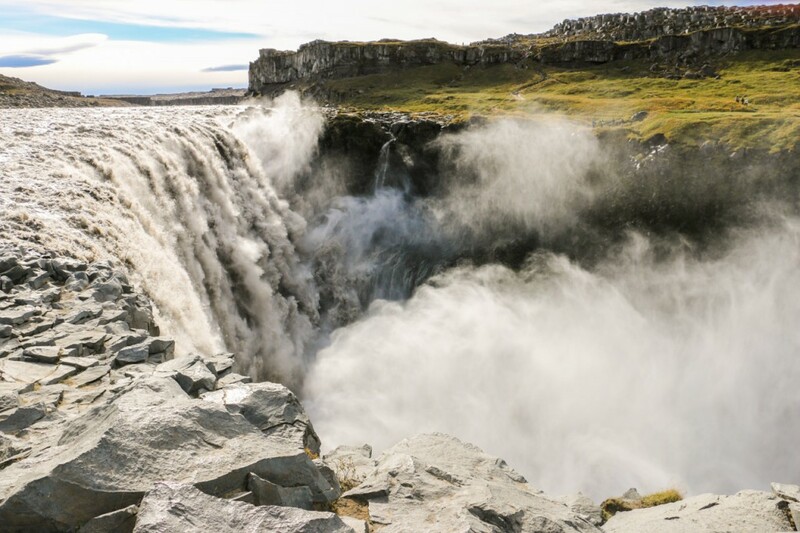 The fact that Dettifoss is so remote and on a less visited part of the country is something that attracts us even more! And yes, this is one of the best waterfalls in Iceland. 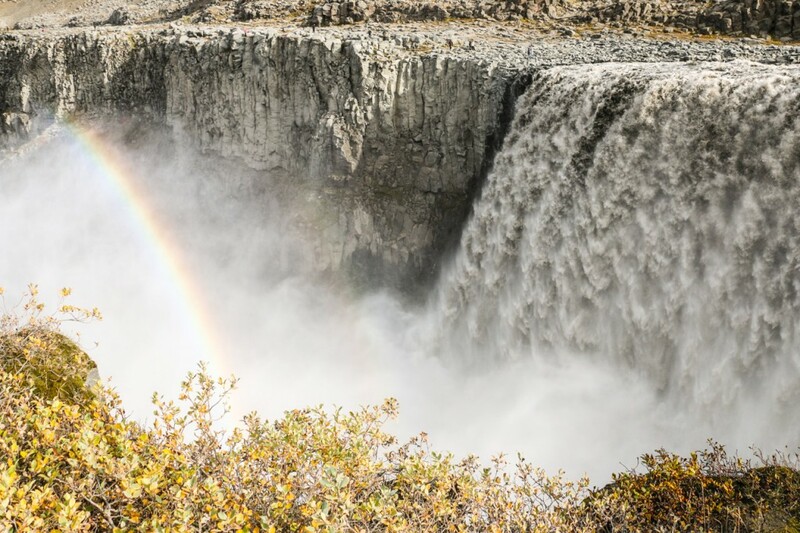 Have you been to Dettifoss? 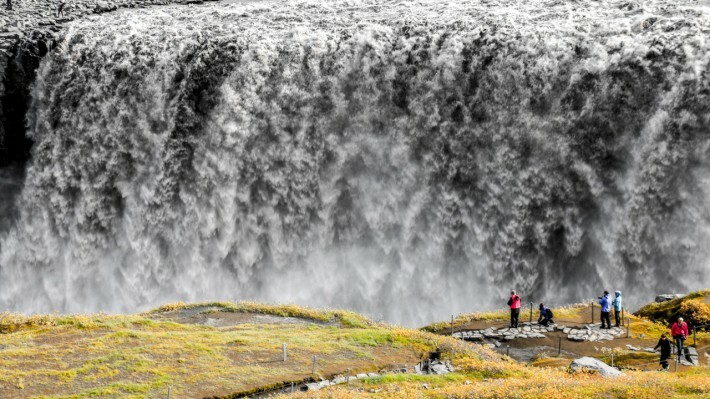 What’s your favourite Iceland waterfall? Let us know! Wow that’s a huge waterfall! Just by looking at it, I am convinced how powerful it is. But the view is spectacular. Unless you are not afraid of heights. Thanks for sharing! It’s quite big. But the power is what impresses the most. We’ve seen others, probably even bigger, yet this one is the POWER. 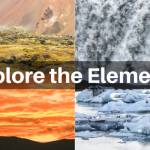 I have always wanted to visit Iceland, however after these videos and photos, I am even more convinced! Your photos are amazing, I specially like the cover one! When did you visit Iceland? Hey Katinha, thanks for your feedback! You should definitely visit Iceland, it’s spectacular. We’ve been there twice. This is from mid-September last year and I just got back this week from another trip there. Planning to go again next year.